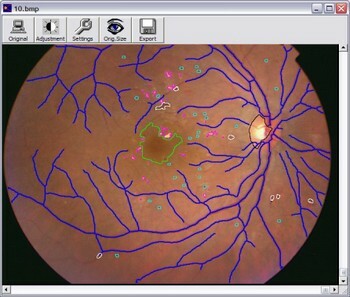 Retinal Analysis Tool, an Aphelion™ stand-alone application, is an advanced and powerful tool for studying the fundus of the eye, using retinographic images. 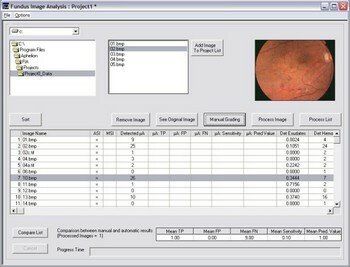 The Tool's processing of fundus images is fully automatic. Its underlying methodology was originally developed in partnership with two prestigious institutes: the Center for Mathematical Morphology at the School of Mines in Paris, and the Lariboisière Hospital in Paris, France1. Current use of the Retinal Analysis Tool is for disease research only. However, this software is also available for integration into system applications for clinical uses, subject to approval by applicable regulatory agencies. Such applications could include diabetic retinopathy and age-related macular degeneration (ARMD). 1 The original development work was funded by the French Ministry of Research.